According to the latest research from Counterpoint’s Monthly Market Pulse, the demand for smartphones in China grew a healthy 17% annually in June. 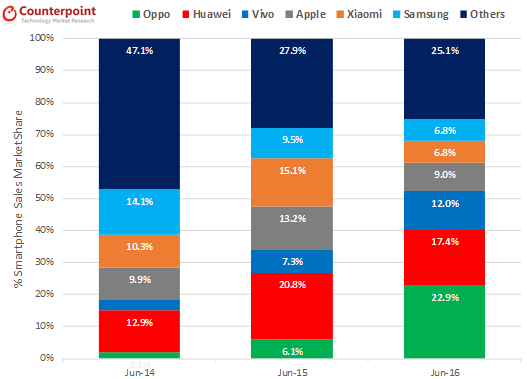 This was the best ever June month in terms of sell-through for smartphones, even though the overall market for the June-ending second quarter has seen modest growth over the first quarter of the year. 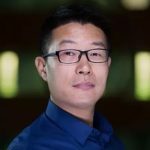 Commenting on the results, Research Director, James Yan, highlighted, “The competitive environment in the world’s leading smartphone market has taken an interesting turn as domestic brands have significantly ramped-up their positions in the smartphone market. Oppo became the number one brand in China for the first time ever in June surpassing Huawei, Apple and Xiaomi with a record 23% market share with sales volumes up a massive 337% annually for the month. Commenting on Oppo’s skyrocket growth, Research Director Neil Shah, noted, “Oppo has adopted a simple but effective strategy, going after the offline market which still contributes more than 70% of total sales in China. Aggressive marketing, promotions and sponsorships, greater offline retail penetration beyond tier-2 and tier-3 cities, better retail margins, dealer support and above all head-turning, innovative smartphone designs has helped Oppo drive its sales in the last eighteen months. “Oppo’s immense focus on industrial design and key features such as camera, battery technology and materials has helped Oppo maintain an edge over its rivals and win consumer mindshare – especially in the under 25 years age group. Oppo R9 and R9 Plus have been the best-selling models for Oppo in June ending quarters with Oppo R9 alone the best-selling model in June. Highlighting on the competitive landscape, Research Director, Peter Richardson noted, “Oppo and Vivo growth story has been impressive and it is important to note that the brands which have entered the top three spots in Chinese smartphone market have tendency to hold on to the spots for atleast for some period of time. 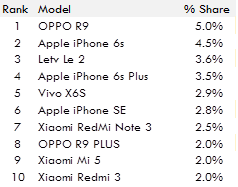 So expect Oppo and Vivo to provide tough competition to Huawei, Apple and Xiaomi in a close fight for the top three spots and consumer mindshare. The importance of brand pull, deeper sales channels penetration and time-to-market with head-turning design and innovative features will decide who owns the first three spots.